Last January 9-12, 2013, Another country has been added to my list, another dream came to life! Together with my Dad and my cousin Ate Judy, we went to China. China will always be extra special for us because our grandfather is Pure Chinese. though he is from the south of China, it was still magical to be able to visit his country, and in a way, our country. I shall be posting more about our China Trip on the coming days but let me start with the first destination we have been to, Forbidden City. 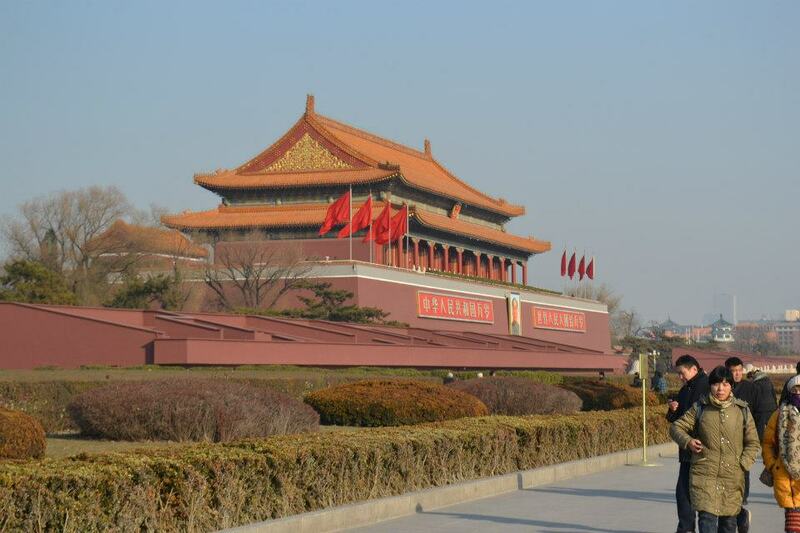 Located in the Tienanmen part of Beijing, Forbidden City has been one of the symbols of Beijing and of China. 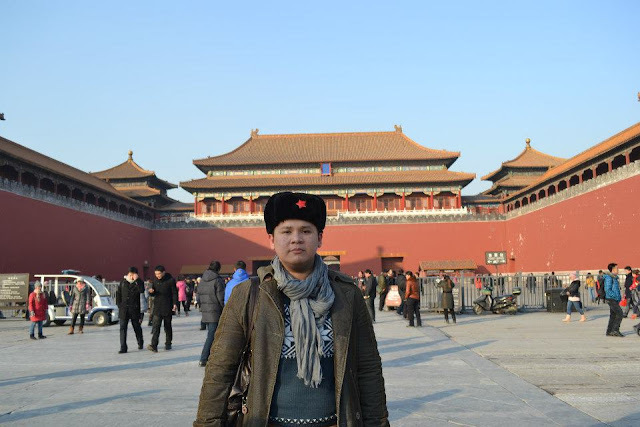 It was the imperial Palace of China during the Ming Dynasty up to the end of the Qing Dynasty. For half a millennium the palace served as the home for the emperors and the whole of his household. 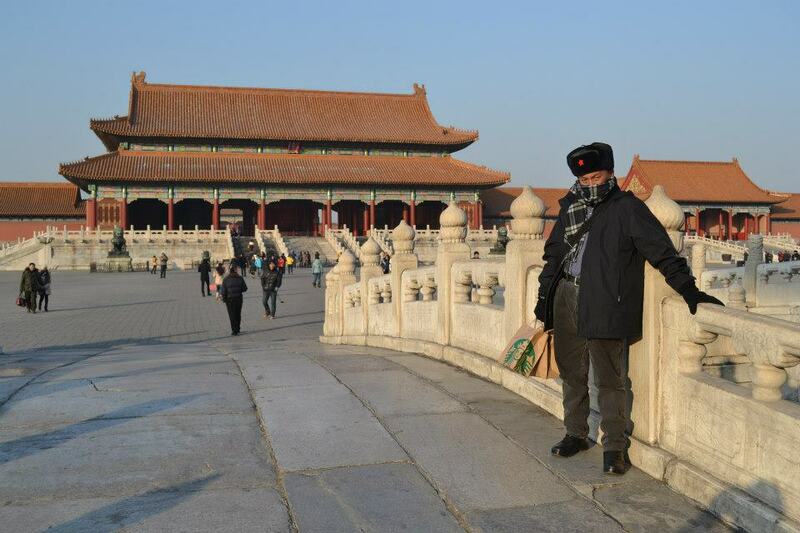 The Forbidden City has been marked as a UNESCO World Heritage Site on 1987. UNESCO listed the site as holding the world's largest collection of preserved ancient wooden structures in the world. 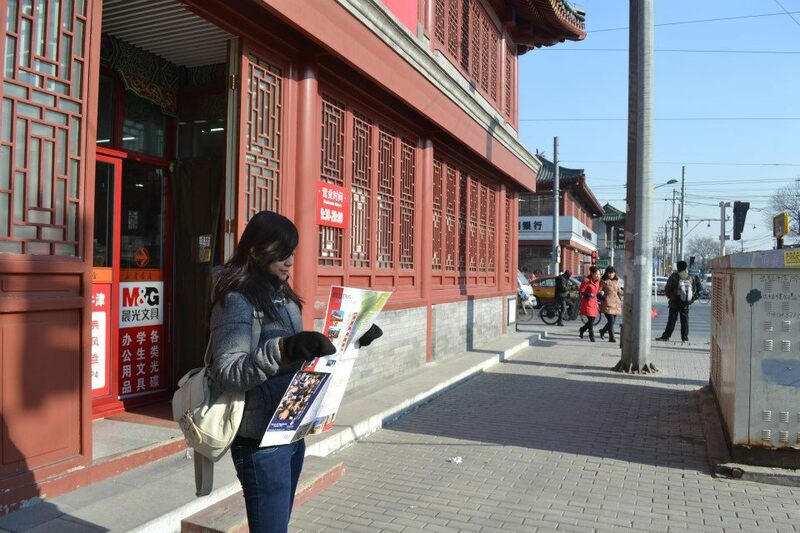 The way to the palace is easy from our home in Beijing, the Red Lantern House. With the help of our map, we followed the route all the way to Xidan and then walked our way until we end on a big Major road with a metal barricade. We then headed left until we see the big red walls with many police. The Forbidden City cops are tall, quiet and reserved and they know very few English But at least, you feel a little bit safer with their presence. We walked and walk until finally, we saw the Front. It was so cold and chilly even in the middle of the afternoon. But at the sight of the first building in front, it was truly astonishing! As always, it felt like I was in a dream! It was just a picture on my desktop computer but now, with the cold of minus three degrees, I confirmed that yes, I am in Beijing! 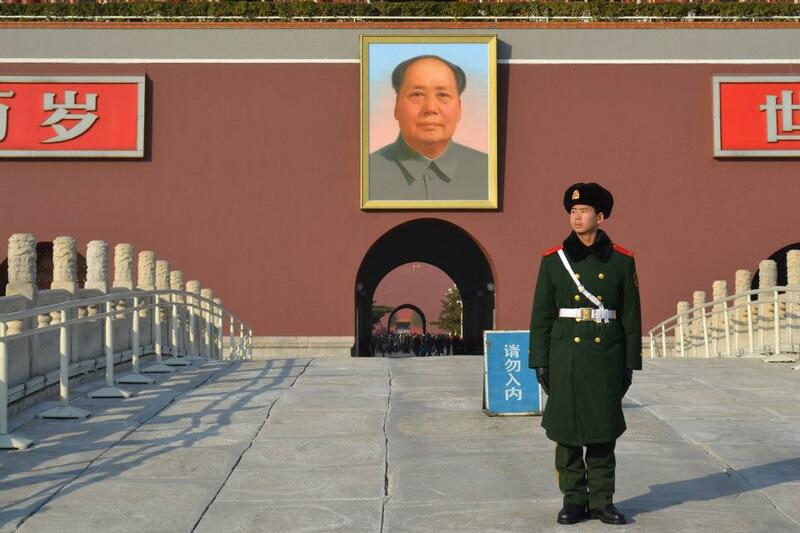 An Imperial Guard guarding the gate with the portrait of Chairman Mao. There were a lot of tourists both local and foreign taking pictures of themselves together with their family and friends! Some Chinese people are conversing me in Mandarin and I think they are asking me to take their pictures which I cheerfully agreed and took their photos. They were really nice and friendly people. The guards are standing dutily firm guarding over the palace and looking after the tourists. People were flocking on their way to pass the first gate to get inside. Through the first two gate, it is free until you reach the Meridian Gate. Everywhere you look is picture worthy! 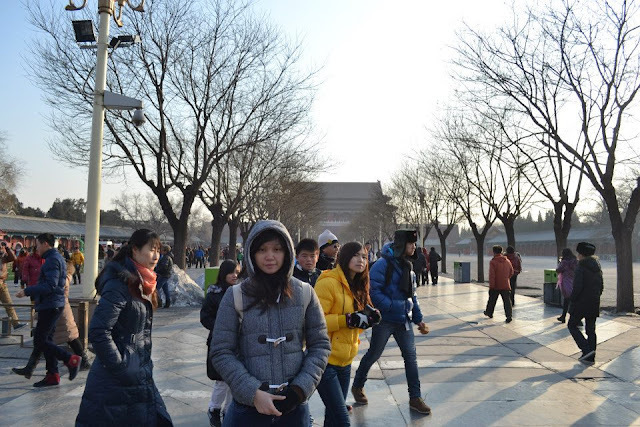 One of the main reasons we went to Beijing on a January is for us to hopefully see snow! For all 5 days we were there, unfortunately, there was 0 snow fall. It was quite sad but experiencing Negative degree temperature was very good enough for me! Maybe it was really not yet my time to see it falling but yes, I did see snow on the grounds! It was slippery as it hardened and started to melt at the heat of the sun. 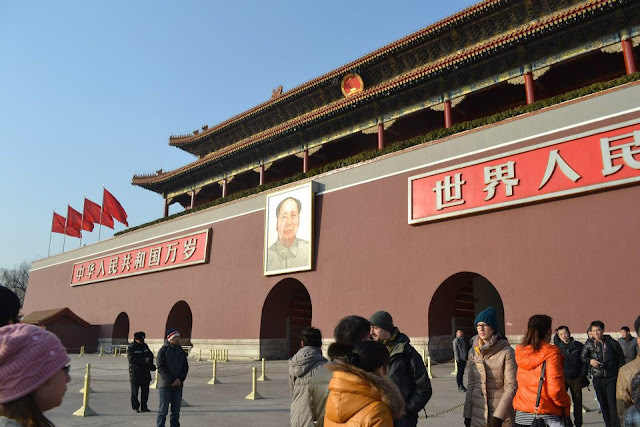 Beijing really is cold in the Winter but as they call it, the city enjoys a Sunny Winter where the suns rays feel mild and comfortable even in negative temperature. But the nights really are cold, which I LOOOVE! I am always a lover of colder weather than the hot ones we have on Philippine Summers! I Love the Philippines but if I would omit something about life here, it's the very hot Summer nights which is so hard for me personally! We went through and through and took many pictures until we saw this vendor selling this Thick black People's Liberation Army Hats which I always wanted to have! I talked to him and we got it for 80 RMB. We bought two of the hats, one for me and another for my Dad. But while we were waiting for change for our 200 RMB, the tourist police went straight in front of us and confiscated all the hats being sold by the vendor. It was full of action and I can't help but feel sorry for the guy so I did not get the change. I don;t know if it was a front by the vendor and the police but well, I got the hats so Yey! Me at the Meridian Gate wearing my PLA Hat. Oh! Here's a little something about my outfit. I was wearing a cotton undershirt inside my Navy Terranova woven long sleeve cardigan which I got from SM MoA. 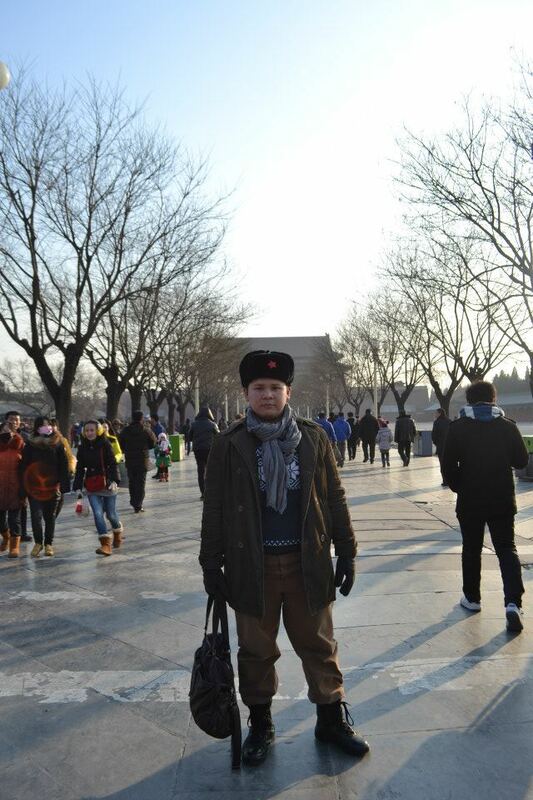 The gray scarf was also from Terranova and the thick trench coat I wore all five Beijing days is from Esprit. I was wearing black leather work-boots and my favorite brown leather bag which carried most of my things including my Niko the camera which was really heavy. And of course, will I forget this cool looking PLA Hat which I got there at Forbidden City? We paid an entrance fee at the Meridian Gate of 30 RMB each and went inside the gates. There I did my Travel dance video using my late iPod Touch where the remaining photos of the Forbidden City trip was in. Oh my I miss my iPod :( So we went on and on and visited two more gate until we decided to get back to the front and go back home for dinner. The place is so beautiful and that time of the day where the sun is starting to set. The shadows were full and the faint gleam of the sun makes the beautiful reds, beiges and browns glow like it was the Ancient times. I feel like I am on the actual set of Chinese Movies set on olden times during the days of the Dynasties. Coming to Beijing was really a dream! Well, everything about the places I travel is always a dream but there at Beijing, it was extra special. Seeing the country where my Ancestors once were at living and fighting for their lives to survive is just awesome to think. While I was there, the magic was so alive that even I was just a quarter Chinese, I feel so connected to that place even if I don't speak the language nor I look like them much. It was a connection that only me and Beijing can ever explain, something that I will treasure for a lifetime! Some people say, those who have been there, that Beijing people are not that friendly or even at times, rude. But for me, I did not have my share of those Beijing people because each and every Beijing local I talked to, bought to was nice and warm. Though they are not as friendly as the Filipinos, their heart are pure. They may not smile at you usually or even look at you, it was the product of their daily battles in life which made them stronger and wiser as they are today! A salute to the Chinese people! A salute to the citizens built through honor and respect! I will truly be honored that a quarter of my blood is as red as the flag of China where people are strong at will but with hearts pure. I don't know at the moment if I will ever set my feet back to this beautiful city, but one thing is for sure, I will do my best to make that happen! Many more dreams to come true!